Saviano’s book starts with great promise. The first five chapters, Part One: The Beginning, are nicely written accounts of Clark’s origins in Texas going back to his grandparents. Guy Clark was born in 1941 in Monahans, in west Texas near the Oklahoma border. It was a sleepy town in the desert, as Saviano tells it, but rich in personality. Many of the people Guy knew as a child became subjects for his songs. I was totally engaged in the story of Clark’s lineage and how it informed his work, especially his early years in Rockport, Texas where his family relocated in 1954. Clark’s father set up his law practice there. In his teens, if he wasn’t playing football, Clark studied science, creative writing and poetry. His father’s associate, Lola Bonner, taught Guy how to play flamenco guitar and introduced him to the recordings of Spanish guitar master,Andres Segovia. That was the musical spark that hooked the 17-year-old Clark to take up the instrument as a hobby. As the Vietnam War was heating up, Clark got an exemption from the draft and participated in the Peace Corps established by John F. Kennedy. After Kennedy’s death in 1963, Clark quit college and decided to take up folk singing and songwriting seriously, much to the chagrin of his parents. It was a calling he couldn’t ignore. Clark was also an oil painter and luthier or guitar maker, a skill set he developed as a teen and never lost. Saviano claims Clark’s craftsmanship as a luthier matched his talent as a songwriter. Saviano also writes extensively about two of the most important people in Clark’s life: his wife Susanna, a bright artist from Oklahoma City, and Townes Van Zandt from Fort Worth, one of the most familiar writers in contemporary folk and country music. As Saviano tells it, the three were inseparable. Susanna and Van Zandt were “soul mates,” according to Clark, who first met Van Zandt in 1965. Clark appreciated Van Zandt’s songwriting style, which he considered poetry set to music. But when they weren’t writing or performing, as Clark describes it, their unusual relationship “revolved around getting drunk and just being big jerks.” Saviano writes well of their relationship but I never got a sense of what really connected them, other than Susanna’s deep feelings for the likable but wounded Van Zandt. After his death, she fell into a deep depression from which she never recovered. She died in 2012. But we do get some nuggets from time to time. For instance, Van Zandt and Clark shared a love for the works of Welsh poet Dylan Thomas. In Clark's view “you can aspire to the same quality of work in your own humbled and whispered way.” I was able to glean that these relationships, like many in Clark’s life, fuelled his subject matter and his style of songwriting, but Saviano doesn’t offer any connections between them or explain how Clark’s point of view set him apart from other songwriters of the time, such as Bob Dylan or Gram Parsons. Saviano never develops an argument about the differences between Clark and Van Zandt’s songs or explains why they’re beloved to this day. By 1971 Clark was auditioning some of his songs for Gerry Teifer, who worked for RCA Records' publishing division. Clark was offered a job in Nashville at the princely sum of $500 as an advance to compose for other singers. 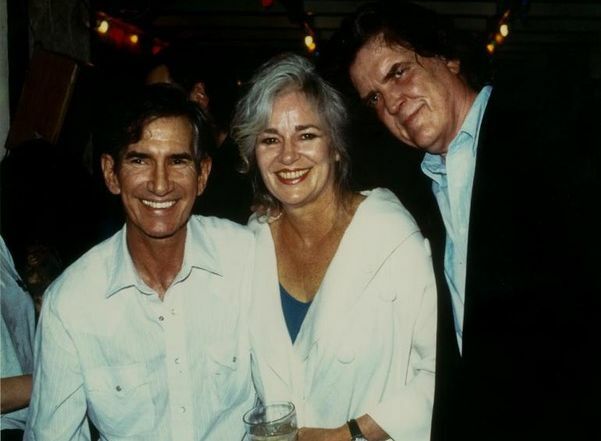 So Clark, Susanna and Van Zandt went to Nashville in 1972 and easily assimilated into the songwriting circle there, which included Kris Kristofferson, Rodney Crowell and a young Steve Earle. The seventies were some of the most fruitful and creative years of Clark’s life but here Saviano’s narrative gets bogged down with too many details about the recordings and general record business conflicts Clark encountered. Her writing thins out and becomes less about Clark’s growth as a songwriter and more about the minutiae of the albums themselves, who was on them and how well they charted. These tales make up the bulk of Part Two: Nashville, 1972 -1997. In Part Three, titled Guy and Me, 1998 – Present, Saviano changes course and starts reproducing large portions of her own diary and even longer transcriptions of her many interviews. By the time we get to Clark’s later years, when his health begins to deteriorate, the book becomes a rambling collage of personal and anecdotal passages without much flow. But among the scattered thoughts and interesting facts about him one eventually gets the sense of the man, his intelligence and humour and how he developed his songwriting technique. He was someone who took considerable time and effort to write lyrics that avoided the clichés often heard in country music today. Fortunately, Clark expunged trucks, whiskey, beer and fast women from his music. His songs were thoughtful works about love and loss and the people and places he cared about. Like the famous Welsh writer who inspired him, Clark considered himself a poet first, and Saviano’s selected transcriptions bear this out. But Saviano’s so wrapped up in the facts about Clark’s life and music she completely avoids any critical evaluation of his work. In my opinion, based on her extensive research, Saviano has certainly earned the right to critique Clark’s songs much as she did in her Oxford American essay, but Saviano uses caution when discussing the 13 albums he released. Like the many people she quotes, Saviano loves Guy Clark, but the book’s overwhelmingly positive and courteous delegation of opinion wears thin. I wanted an argumentative book about Guy Clark that balanced the facts with criticism. Her book often reads like a friendly movie transcript, which is no coincidence because Saviano is currently working on a documentary with the same title. For this book Saviano doesn’t fold the facts into a portrait of the artist. Her writing, which often reads like a police report, suffers as a result. Consequently my engagement with the Guy Clark story often waned under the weight of Saviano’s unfocussed writing. 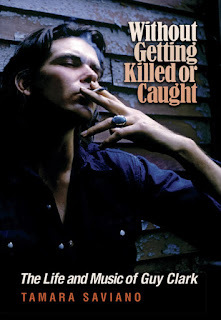 That said, I do recommend Without Getting Killed or Caught: The Life and Music of Guy Clark for the strength of its sources. Saviano has shared some thoughts, stories and insights from the man himself, his friends, fellow musicians and family members that are invaluable.